Immediately after the workshop was opened this morning I grabbed sandpaper and gave the Houdini hatch trims a light rub down. They were then given a final coat of satin varnish and left in the warm meal room to dry. Next it was the turn of all the pieces of oak ceiling trim Richard had made yesterday afternoon. They will go in the lockers and conceal the high level wiring. James glued and then clamped his rear door liners in place. 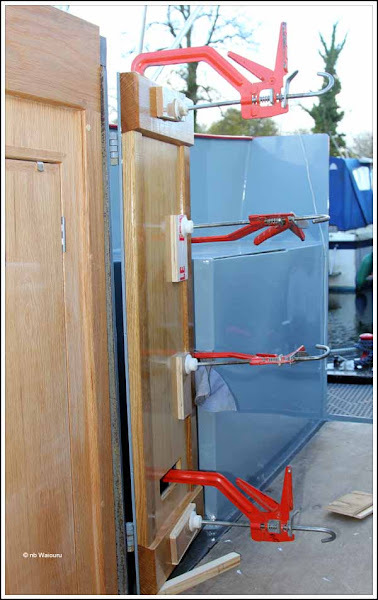 The clamps were left on the doors until 4:00pm. By then it was starting to get dark and the temperature had dropped so I removed them. James then kindly fitted the ventilation grills which will avoid the hurricane coming into the cabin tonight. 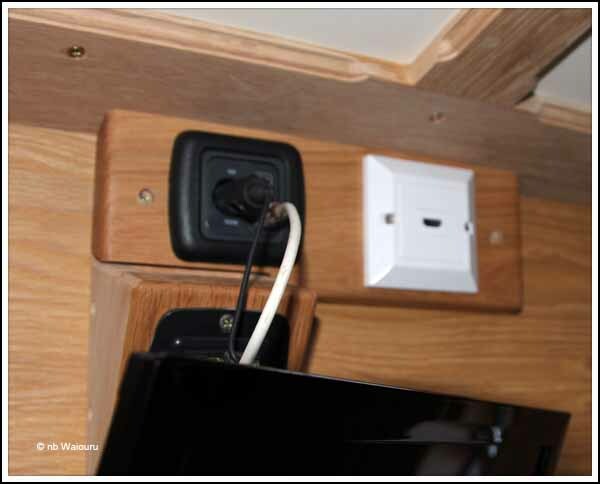 James also fitted the oak mounting block for the sockets above the small TV in the bedroom. This enabled me to fit the combined 12v & aerial socket plus the HDMI socket. I was worried about the fitting of the HDMI faceplate (the white plate) as the cable is very short. In the end it was the combined 12v and aerial socket that proved difficult to fit. Yes… it was a spray foam issue! Not enough clearance behind the plug for the coaxial cable. I used the Leatherman to pick out some foam which eventually solved the problem. 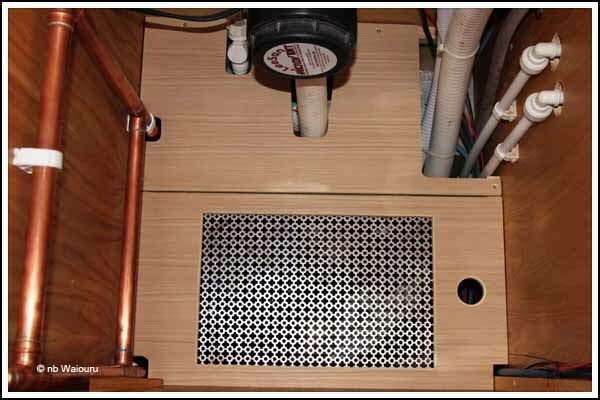 Richard has been working on the fit-out of the stern wet locker. Jan and I agreed we wanted three things from the locker. Richard has been able to achieve all of this. View looking down into the base of the locker. He fitted battens around the walls of locker 300mm above the floor level. This conceals pumpout and rinse connections to the blackwater tank and also provides a long term storage area. It currently contains the new vacuum cleaner <oops> hoover. The front half of the lower shelf has a stainless steel grill built into it. The grill was lying around the workshop so I cut it down to size with the angle grinder and Richard fitted it into the shelf. You may recall all the warm air from the inverter on the opposite side of the boat is pushed into the wet locker by two computer fans. The warm air should rise up through this grill to warm everything in the wet locker. Tomorrow Richard will make the high level shelf which will have a coat hanger rail underneath. Richard and I discussed the Houdini hatch trim and decided not to fit them until all the oak trim on the ceiling has been varnished. James will probably complete the trim around the back hatch tomorrow and; if all goes well; fit the door lock. Skirt and Bonnet now on! First Short Cruise… and in reverse! Fresh Road Kill of the Day!